Fourth Row Center: Film Writings by Jason Bailey: Tribeca: "Ondine"
The fisherman pulls her out of the water, in his nets. She’s unconscious, but somehow, inexplicably, she’s alive; she wakes up and, after the initial shock, she takes a liking to the fisherman, who lets her stay with him. But it’s not until later, when he is keeping his daughter company during her dialysis by telling her the story of his day (“Why’s it always have to start with ‘once upon a time’?” she demands) that we realize what writer/director Neil Jordan is up to: he’s gone back to Ireland and made himself a fairy tale. The result is Ondine, a lush, sweetly intimate picture that works both as an adult romance and a fantasy. It also marks an unexpected turn for the consistently unpredictable Jordan, who is following up a scattershot biographical comedy and a slick studio thriller with a project that bears little resemblance to anything in his filmography—save for his second picture, the oddball “Little Red Riding Hood” riff Company of Wolves. Of course, these things never do last forever. There’s a malevolent danger approaching, someone or something that is looking for Ondine, providing a Big Bad Wolf-style threat to the makeshift family’s “happy ever after.” What to do? “Nothing makes sense,” Syracuse says. “That’s why I’m afraid.” But evil must be faced, and hopefully conquered; by the time the unexpectedly intense climax approaches, we’ve grown attached to the trio, to the love and tenderness between Syracuse and Ondine, to the sweet relationship between the father and daughter, to the burgeoning affection between Annie and her selkie. Ondine is an absolute charmer, gorgeously photographed by the great Christopher Doyle (Hero, Chunking Express), who shoots the Cork, Ireland locations as a world of greens and blues, of lush, rolling hills, but one that is perpetually overcast—an effective metaphor for the reality around the edges of the fanciful tale. Jordan’s direction is relaxed and enjoyable; his camera is active and involved without being obnoxious about it, and he coaxes natural performances out of newcomers Bachleda and Barry, as well as veterans Farrell (continuing a streak of good work) and his good-luck charm, Stephen Rea, who appears as the village priest. His scenes with Farrell are the picture’s comic highlights, as Syracuse goes to confession because “there’s no AA chapter in this poxy town”; when he informs the priest, from inside the confessional, that his announcement of time sober is supposed to get applause, the priest replies, “Where’d you see that, in a movie?” The supporting roles are filled with naturalistic actors who lend an authenticity to the film—in fact, if there’s a complaint to be heard, it’s that the accents are so thick that, at a couple of important moments, this viewer had to piece a plot turn together from context clues rather than explicit dialogue. Jordan makes a brave, risky choice in Ondine: to make a film that has infinite potential for absolute silliness, and to then play it straight and make it work. The result is warm, lovely, and lyrical. It’s a perfectly beguiling little movie. 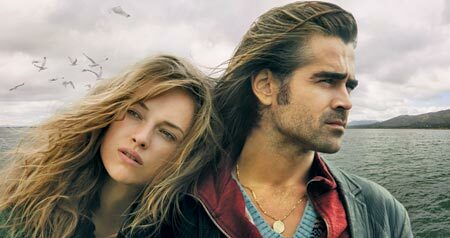 "Ondine" screens April 28, April 29, and May 1 as part of the 2010 Tribeca Film Festival. It is slated to open June 4th in limited release. New on Blu/Saturday Night at the Movies: "M"
Tribeca: "The Disapperance of Alice Creed"
Tribeca: "My Own Love Song"
Tribeca: "Joan Rivers: A Piece of Work"
Tribeca: "Arias with a Twist: The Docufantasy"
On DVD: "44 Inch Chest"
On DVD: "The Young Victoria"
On DVD: "The Lovely Bones"
New on Blu: "The Thomas Crown Affair (1999)"